A poet who wanted to become a pilot. History is all about facts, authenticity and it is truely scientific in nature. Being a student of history, I was always interested in the traditional way of studying it which is mostly confined in the tussles and treaties. I never had a scientific approach to study it till my graduation. It was in 2003, when I was pursuing my Masters Degree from Pune University, I came to understand the importance of numismatics in history. Since then, the study of coins has become not only a matter of interest for me but a hobby as well. This was utterly amazing for me to believe that the mere coins which are, in reality made for meeting the need of individuals in their day to day lives are also such prolific in their substantiality. Though, the coins which I have collected so far are very few in numbers but the same can emerge very useful in making a historical survey of about 400 years. They are mostly minted in copper and a very few of them are made up of silver and aluminum. They belong to the period of Great Mughals, British East India Company and British Indian Empire. The oldest coin in my collection was issued in 1616 A.D.by the Mughal Badshah Jehangir. There is a popular saying which goes like ‘Man proposes, God disposes’. The life of the celebrated and renowned poet of Sikkim, Late Agam Singh Tamang “APATAN” bears an ample testimony to the saying as we find that the poet would have become a pilot had fortune not played its role over his fate. Very few of us can believe that even a poet can think of becoming a pilot. It is the irony of the life of the famous poet. In his earlier days of life, he dreamt of becoming an air pilot. His days at the St. Joseph’s College, Darjeeling added more vigour to his dream when he came across many young English and Indian pilots. He was all set to go for finding his destination but his grandfather; a Mukhtiyar of Namchi did not want him to go to the utterly risky enterprise. Agam was brought back to Sikkim forcibly and was home locked. Thus, the desire and expectation of a young enthusiastic fellow were made the subjects of sacrifice by the so called care and conservative nature of a sophisticated family. Nevertheless, he joined Namchi Primary School as a teacher and subsequently became a poet of grandeur in Sikkimese context. Late Agam Singh Tamang "APATAN" with his wife. The facts presented above about Late Agam Singh Tamang "APATAN" have been substantiated after an interview with his younger sister, Mrs. Rup Maya Tamang who stays presently in Namchi. Late Man Bahadur Tamang was born in July 1925, at Ranka, East Sikkim. After completing his Xth standard from Tashi Namgyal Sr. Sec. School (the first English medium school of Sikkim which was started in 1906 and was known as Gangtok School in its earlier days) in 1944, he was recruited in the Imperial British Army at the age of 19. After completing his training in various parts of India, he served in the Army Office in India. He could not take part in the Second World War, as it was in its last phase when he was recruited. With the withdrawal of the British from India, Lt. Tamang went to Singapore where he got Commissioned and worked there as a Sergeant in the British Army from 1948 to 1951. He was posted in Hong Kong in 1951, and remained there for one year. In 1952, he was again posted to Malaysia from where he got his retirement in 1957 and came back to Sikkim. A person with a great caliber and an enthusiast to acquire higher education, Lt. Tamang could not remain idle even after his retirement. He joined a new job as an accountant at B.T. College and studied in the Night Session at St. Joseph’s College, Darjeeling. From there, he completed his Graduation in 1968 after which he again joined British Army as an Account Officer in Ilam (Nepal). After serving there for 14 years, Lt. Man Bahadur Tamang got his retirement in 1982 and made his way back to Sikkim. A close relative of Kavi Agam Singh Tamang “APATAN” and Lt. Tulshi Bahadur Chettri “APATAN”, Sergeant Tamang is probably the first Commissioned Officer of the Imperial British Army from Sikkim. Due to his dedication and sincerity to serve the British Army, the Royal British Government honoured 21146964 Sergeant Man Bahadur Tamang of 7/7 Gorkha Regiment with King George VI Medal (Malaya) and King George VI Medal (Great Britain). Lt. Tamang died on 27th June 1990 at Namchi District Hospital due to throat cancer. Medals of Sergeant Man Bahadur Tamang. The facts presented above about Lt. Man Bahadur Tamang have been substantiated after an interview with his wife, Mrs. Rup Maya Tamang who stays presently in Namchi. Sitting on the ground( Second from Left) Kavi Agam Singh Tamang. 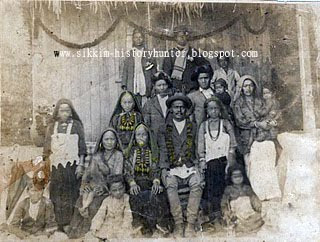 My blog inspired one of my students, Miss Chungku Bhutia, who eventually facilitated me with a what we call to be an antique photograph of a Mukhtiyar family which refers to her maternal ancestors. It belongs to the family of a renowned poet of Sikkim, Kavi Agam Singh Tamang(APATAN) who was a sibling of a Mukhtiyar family of Namchi, South Sikkim. The person at the centre in the photograph is Lt. San Man Lama, the Mukhtiyar of Namchi who is also the grand father of Kavi Agam Singh Tamang. The main role of the Mukhtiyar was to confer justice to the needy in different cases. Looking at the present scenario, the post of a Mukhtiyar is akin to the post of a District Magistrate.Looking at the attires and ornaments the figures in the photograph are clad in, the family looks like a royal one possessing enormous wealth. The study of coins, specifically the older ones is known to be Numismatics and this bears a pivotal role in finding out of the socio-economic scenario of any country of a given time period. On top of that, Numismatics has always played an important role for the study of history. This not only gives information about the various dynasties and their reigns, but also provides good knowledge about the economic aspects of a country. Therefore, the importance of numismatics cannot be overruled to achieve a solid idea about the past. To be very precise, this is equally important for the students and the scholars of History to take interest in Numismatics in order to grab the fullest possible idea about the past. In simple terms, it also draws the same attention as by other sources of history, viz. literary, ephigraphical and other important sources in determining the historical milestones of a nation. But, this is very disheartening to note that some of the Historians whom we come across while studying history do not put proper emphasis on this inevitable factor and thus nullify the genuineness of the study of Numismatics. It was in 2003, when I was pursuing my Masters Degree from Pune University, I came to understand the importance of numismatics in history. I was greatly inspired by the old coins which were shown to us by our Professor Dr. Mrs. Shila Patwardhan. Since then, the study of coins has become not only a matter of interest for me but a hobby as well. This was utterly amazing for me to believe that the mere coins which are, in reality made for meeting the need of individuals in their day to day lives are also such prolific in their substantiality. Though, the coins which I have collected so far are very few in numbers but the same can emerge very useful in making a historical survey of about 400 years. I have illustrated and enumerated the importance of the coins in the subsequent paragraphs and this effort on my part will have an adorable reception, I do expect. Metal used for the coin : Copper. Year of Issue : 1616 A.D.
Obverse : Sacred words of the Holy Quran along with 786, the holy number believed by the Muslims. Reverse : Sacred words of the Holy Quran. Description : The coin was issued in 1616 A.D., the period when the influence of Nur-Jahan over the Emperor Jahangir was at its height. Made up of copper the coin weights approx. 18 grams. The coin looks more Islamic in its appearance than Indian. Year of Issue:- 1616 A.D.
Place of mint:- Unknown, probably Surat, the Head Quarter of the English East India Company. Obverse:- Transcribed in English “East India Company U.K.” with the mention of the year of issue as 1616. Reverse:- Two balloon like objects have been featured. Issuing Authority:- East India Company U.K. Description:- The East India Company was founded in 1600 A.D. as they secured their permission to establish their Company in Surat. From this coin, it becomes evident that the East India Company not only secured permission to set-up a Company but, they also secured their right to mint coin in their own name. Year of Issue:- 1717 A.D.
Obverse:- Written in English “East India Company U.K.” mentioned the year of issue as 1717. Reverse:- Portrait of Mecca, the holy place of the Muslims along with a half moon and a star. The reverse side of the coin also shows 786, the holy number of the Muslims. Description:- The earlier coins issued by the east India Company had some secular features as we have seen, that they had featured a balloon like object on the reverse of the coins issued by them a century ago. But, this coin has the mark of Islamic religion. They engraved it on their coin to maintain a cordial relation with the Mughal authority. Their stay in India for more than a century had made them enabled to understand the Indian society in a broader manner. In order to secure more trade privileges from the Mughal Empire, they needed to show a kind of respect towards the religion of the rulers. These reasons might have compelled the East India Company to depict the image of Mecca on their coins. Year of Issue:- 1818 A.D.
Obverse:- Written in English the name of the concerned authority as “East Indya Company U.K”. The name of the place where the coin was minted has been written in Devanagari as Ratlam and is placed at the centre of the coin. At the bottom, the year of its issue is written in English. At the centre, OM the religious symbol of the Hindus is featured with few flowery designs. Reverse:- Written in Devanagari ‘Saach Bolo Sach Taulo’ in a semi-circle manner that covers both the sides of the coin. In the middle of this writing, a figure of Lord Hanuman is depicted. At the bottom the name of issuing authority is mentioned. This coin is locally known in Sikkim as Hanumaney Paisa. Description:- In this coin the word India is written as INDYA which suggests that the coins were probably minted by the Indian minters. The depiction of the major Indian Gods on the East India Company’s coins shows that they had a bigger aim of flourishing their trade. Politically they were well aware from the fact that the Great Mughal Empire was at the verge of disintegration. Hence, to expand their trade they wanted to have a cordial relation with some great Hindu kingdoms like Marathas and the Sikhs. This may be the important reason why they have featured the Hindu Gods on their coins. Obverse:- Name of the issuing authority is written in a semi- circle style along with the year of its issue on the bottom of the coin with few flowery designs. Reverse:-. In the middle, a figure of Lord Hanuman lifting Sumeru Mountain is depicted. This coin is also locally known in Sikkim as Hanumaney Paisa. Description:- Same as Coin No.3.